Who hasn’t looked up at the sky and seen a whale or a poodle or a sports car? There’s something about clouds that excites the imagination. Their shape-shifting nature means they never fail to entertain and intrigue us. Here in our little archipelago we certainly get our fair share. Whether it’s the dumpy, fair-weather cumulus of a hot day in high summer or the spirit-dampening stratus of a wet November weekend, it’s hard to imagine our skies without them. It’s impossible to pin down a cloud and this rich and varied selection reflects that beguiling elusiveness. 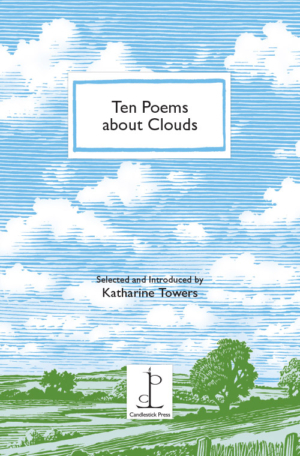 Poems selected by Katharine Towers. Poems by Liz Berry, Billy Collins, Emily Dickinson, John Glenday, Paula Meehan, Fiona Sampson, Lesley Saunders, Katharine Towers, Derek Walcott and Sarah Westcott. Cover illustration by Bill Sanderson.